La Balconada Beach Uruguay offers; balmy ocean breezes, long stretches of golden sandy shoreline; magnificent sunrises; exotic and colorful sunsets; and panoramic views that will take your breath away. All of these experiences are waiting for you at La Balconada Beach. If you have wanted to find a getaway adventure that lets you explore Uruguay on your own terms then this Oceanside setting in Uruguay is one you will surely appreciate. La Paloma beaches are a relaxing and enjoyable holiday destination and La Balconada Beach Uruguay is one of the most popular choices. When you visit this sun drenched paradise it is obvious that La Balconada Beach is an ideal site no matter what season of the year may be at hand. 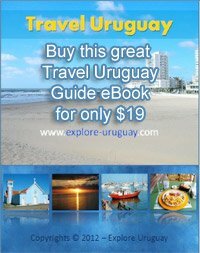 The people of Uruguay and travelers already familiar with many of the Uruguay beaches know that this region is where every person will be able to find a coastal setting that will become their personal favorite. Whatever features of a beach are most appealing to your own sensibilities and personal preferences can be discovered at La Balconada Beach or one of the other beaches of La Paloma such as El Cabito Beach Uruguay. Some people may prefer a windy landscape with cliffs and rocky outcrops surrounding the shoreline, while others may prefer a wide expanse of sand where large, high waves create spectacular visual effects as they surge from the ocean to the land. La Paloma beaches are well known for providing a variety of adventures and views and La Balconada Beach is considered by many to be the crown jewel of them all. The coastal city of La Paloma lies along the Santa Maria Cape which adds extraordinary beauty and panoramic views to the shoreline. Families and young adults all enjoy the wonders and excitement that are all part of this Uruguay beach setting and you will find that many beachgoers flock to the area nearest the lighthouse. La Balconada Beach has both a protected cove that is perfect for families to enjoy. The gentle water is tranquil and enticing with soft waves that lap against the golden sands. There is also an open expanse of coastline where the waves are high, the winds are strong, and adventure beckons. Surfing enthusiasts and others searching for an adrenaline packed experience can be found along the steeper areas of this beach as they answer the siren call to pit their talents and skills against the crashing power of the ocean waves. Balconada Beach Hostel is one of the accommodations in Uruguay available for tourists who wish to stay very close to the ocean. The rates are reasonable, the rooms are neat and clean and a daily breakfast is included. If you are staying in the city of La Paloma other lodgings can be found at the Cabo Polonio Hostel or the Hostel Altena 5000.